I was on vacation in Seattle, and was hunting around used record stores for the WarGames soundtrack (which I eventually found... but that's another story). A couple of the stores also had used video games. This particular one, Al's Music (in the University district) had a good chunk of vintage stuff, including a boxed Odyssey2, and some other classic consoles. There were a few boxes of 2600 commons sitting on their top shelf, which I sifted through to no avail. They also had this game selector unit up there, although at first I didn't plan to get it, since it was more money than I wanted to spend. After all, it was just a game selector, right? I left the store without it, and continued vinyl hunting elsewhere. Now, a little bit about the unit. 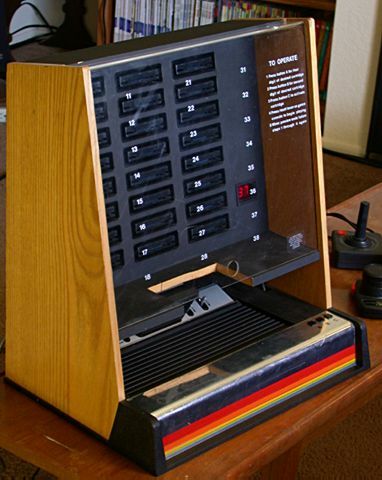 You select a game by entering its number with two buttons, and press a third button to load it. 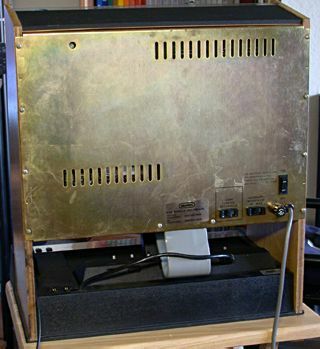 The kiosk switches to that cart and cycles the power to the 2600 (provided you've plugged it into the outlet on the back), loading up that game. 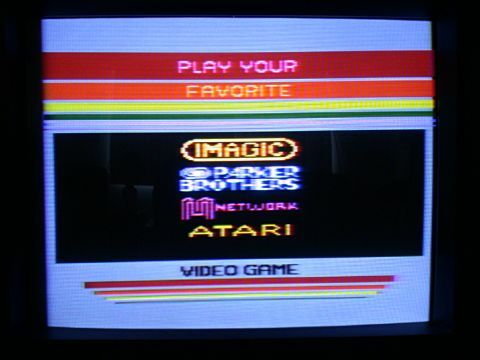 You can switch games at any time - pressing any of the kiosk buttons returns you to the splash screen, until another game is selected. 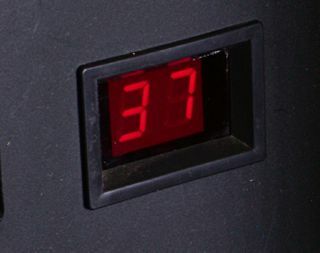 There's also an adjustment potentiometer on the back of the unit that will set the length of time you can play a game before it returns to the splash screen. I haven't fully tested the range, but the minimum is about 1 minute, and the maximum is at least 30 minutes (possibly more). This was probably put in place to keep people from playing the same game for hours on end, and hogging the display. You can also hot-swap cartridges while the unit is on. Just return to the splash screen, swap out any cart, and select it. Very cool. So far I've loaded up 24 games, and tested the unit to make sure it switches to all of them. 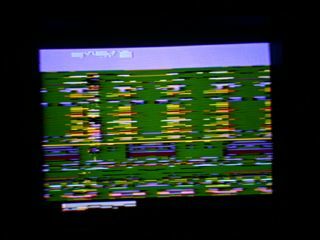 It seems to be working perfectly, although a couple of times there was some noise on screen, but cycling the 2600's power took care of it. A temporary glitch, it seems. 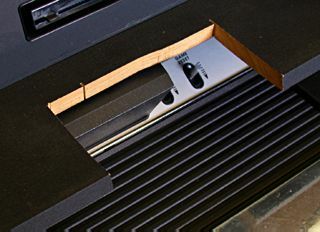 The plexiglass cover slides down over the front of the unit, allowing for quick and easy cartridge swapping. Oddly enough, there's no way to lock it, which I would have thought would have been really important in a store demo unit. The cover doesn't allow enough clearance for some longer carts. 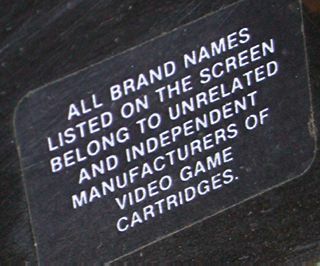 The unit was built in 1982, so it's likely that longer carts (such as Xonox double-enders or CommaVid carts) either weren't around yet, or Imagic simply didn't take them into consideration. 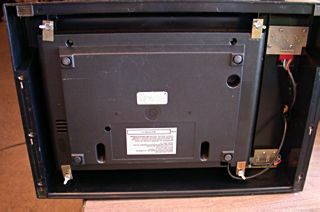 CommaVid carts are about 1/4" too long for the cover to close. Konami carts and Boing! barely clear. The design of the kiosk was very well thought out. 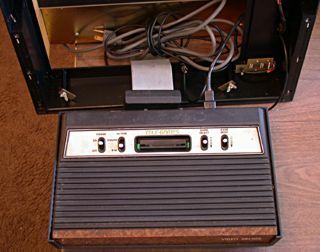 It's very simple to use, the 2600 fits perfectly in it, and it even has a splitter for Player 1's controller port, so a joystick and a set of paddles can be plugged in at the same time. The unit is in excellent shape, with only minor scratches on the plexiglass cover and the chrome, and a section of wood on the lower shelf cut out (more on that later). And now, on with the pics. Enjoy! 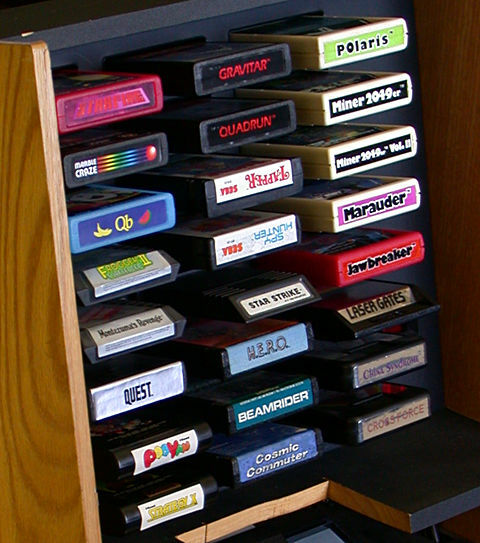 The buttons used to select the games. (See instructions below). 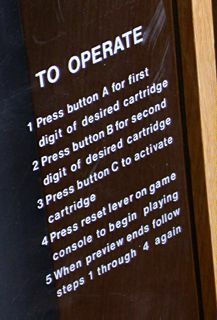 The instructions (printed on the inside of the plexiglass, which is why they're still in good shape). And the obligatory disclaimer (a sticker, also on the inside). The LCD display. It only displays 11-18, 21-28, 31-38, so you can't select a non-existent slot. Some previous owner had chopped a chunk out of the lower wooden shelf. At first, I couldn't figure out why they did that, then I discovered that not all games work with the kiosk, so they probably did it so they could play those games. It's a sloppy solution though, and I'm not sure if I'll try to patch it, clean up the hole a little, or just leave it. 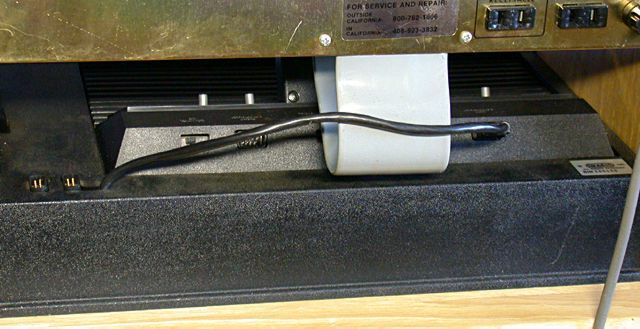 As it is, the hole is too small to easily unplug the kiosk interface cartridge anyway. Another angle. 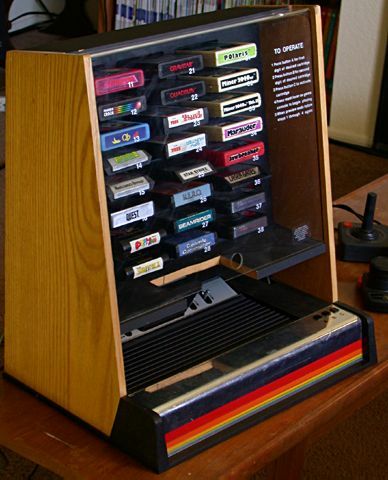 Without the cut-out, there's no way to remove the cartridge without taking the Atari out. The space is a little tight anyway, but you can still reach the console switches. Here's the underside of the kiosk. 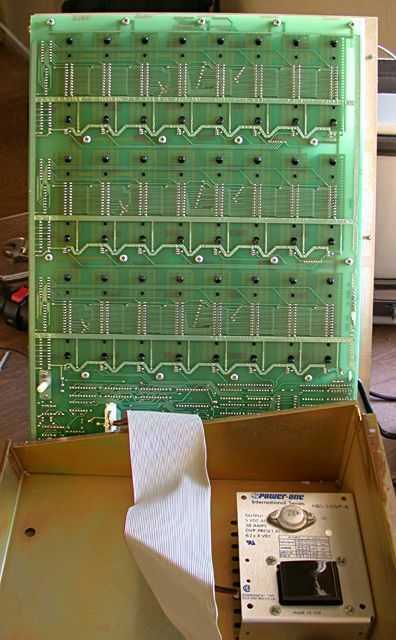 The clips hold the 2600 snugly in place. It's very easy to remove by just loosening four wingnuts. Like so. This is the 4-switch Telegames that came with it, so this was probably used in a Sears store. It seems to be the original one for the kiosk - all of the 20+ years of dirt and crud were in the right places. 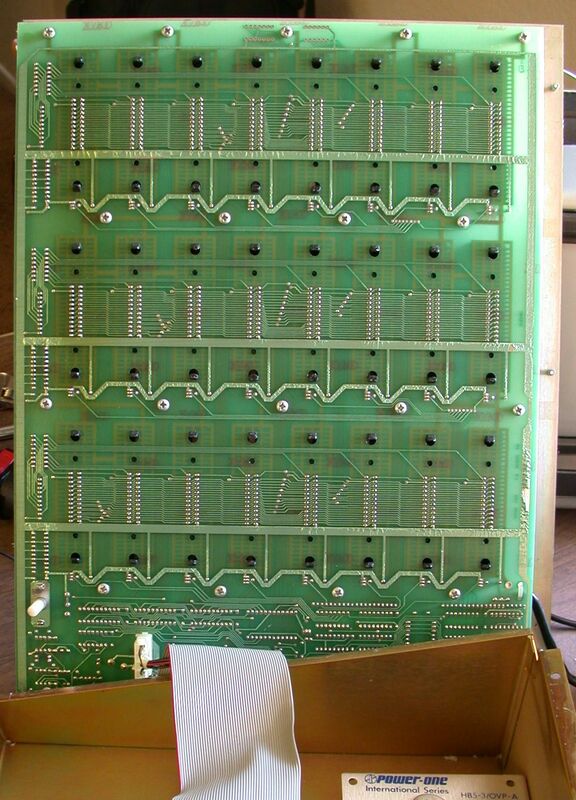 Here's a close-up of the circuit board beneath the selector buttons. And the underside of the joystick splitter. Here's the backside of the unit. Anodized aluminum, with lots of fingerprints. I haven't tried to polish them out. 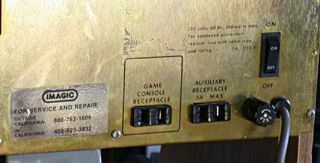 At the top left, is the potentiometer for adjusting the gameplay time. The outlets work, but the connections are extremely loose. If I can find replacements, I'll change them out. As it is, they work if I spread the plug's prongs out (I use an extension cord for that). Here's a close-up of the hook-ups. 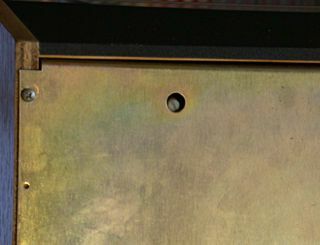 The two joystick ports (at left) are where you plug in the paddles and player 1's joystick. 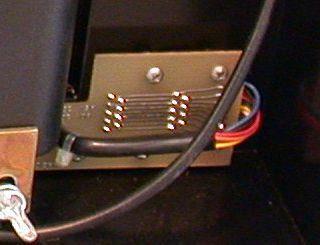 Player 2's joystick plugs into the Atari itself. Sorry - no four-player action. 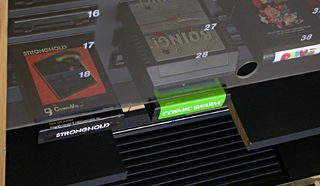 The ribbon cable is attached to the end of the interface cartridge. The inside of the unit and the cartridge slots were all pretty clean. 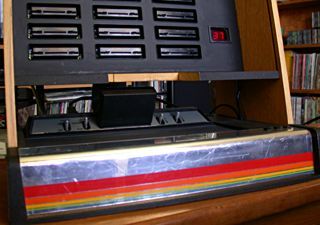 The outside of it, especially the 2600, was pretty filthy, and stunk of cigarettes (hint to smokers: keep your collectibles in some room other than where you smoke). I spent awhile cleaning it up for these pics, and it's looking pretty good now. It still smells a little, though. That's pretty much it for now! When I have the chance, I'll look into testing the gameplay timer to see what the limits are.